Tidal Toss is a 1-vs-3 minigame found in Mario Party 3. 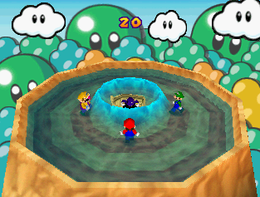 The mini-game is similar to Makin' Waves from Mario Party 4, but with the roles of the single player and the team reversed. It returns in Mario Party: The Top 100. Three players try to stay on the platform while the solo player attempts to knock them off by either jumping on or Ground Pounding the boat and making waves, with their size being dependent on the force of the jump/Ground Pound. If one of the three players gets knocked off the platform, he/she will be kicked out of the minigame. If the player on the boat knocks off all three of the other players, that player wins. However, if at least a single member of the three player team survives, the team wins. 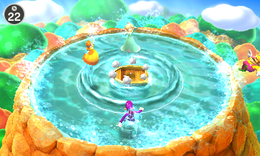 Game Rules – "Jump to avoid the waves caused by the player in the boat." Advice – "The size of the wave depends on the height of your Ground Pound. Just jumping will also cause a wave." Description – "Who's rocking the boat?! Whoever it is, don't let the waves that player makes knock you over the edge!" On-screen (Solo) – "Ground Pound the boat to send waves at your rivals!" On-screen (Team) – "Dodge the waves until time runs out!" This page was last edited on August 4, 2018, at 09:14.